This retreat provides an adventurous mix of travel, yoga, beach, bush and SAFARI Practice yoga in some of the most beautiful places in Kenya. 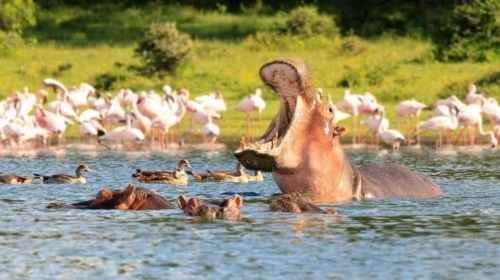 You'll have a true African bush experience, exploring 5 of Kenyas world renowned sites including Lake Nakuru Park, Lake Naivasha Park, Hells Gate Park, Amboseli Park, Tsavo East Park...while also enjoying the magic, and sense of connection and calm that comes with a yoga retreat, daily yoga and meditation practice. Following our bush adventure we will decompress with 7 days on the white sand beaches of Diani Beach, Kenya. Combining the natural beauty of the African bush and beach with the mental and physical benefits of yoga, the focus will be on instilling a deep sense of relaxation and tranquility. Day 1: Arrive in Nairobi, Kenya and transfer to accommodation on lake Naivasha to get settled in. Day 2: Hells Gate National Park! 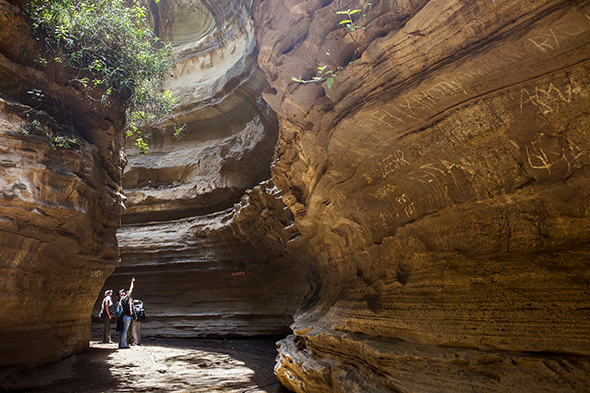 One of the few parks where walking and hiking is encouraged, it's known for its nature trails as well as its herds of buffalo, zebra, giraffe, eland, hartebeest and two species of antelope. Bird watchers can spot vultures, Verreaux's Eagles , Augur Buzzards and swifts. Day 3: Lake Nakuru Park! 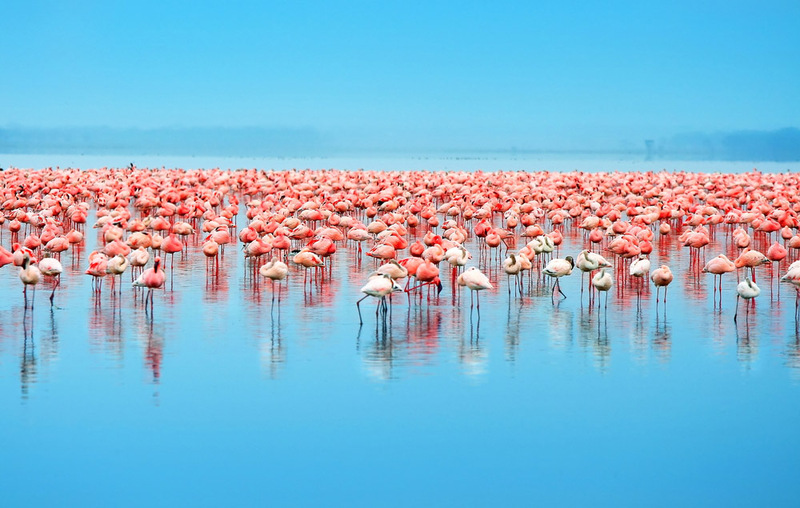 Over 400 species of birdlife have been recorded at the lake, making this yet another of Kenya's major ornithological sites. In addition to the birdlife, the park is home to herds of buffalo, waterbuck, impala, Rothschild giraffe, and leopard. A defined area of the park has now been designated a rhino sanctuary making Nakuru the best park in Kenya for seeing Rhino. 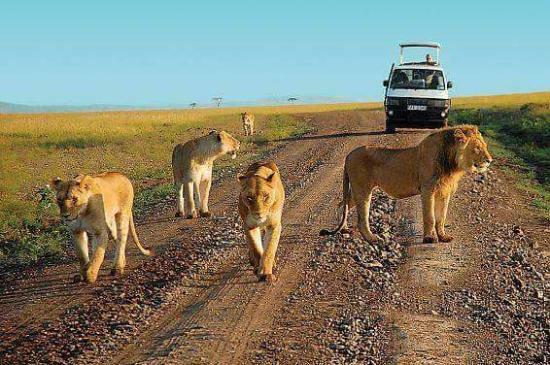 Day 4: Naivasha to Ambuseli Park- We will road trip to Amboseli National Park, located at the foot of Mount Kilimanjaro and consists of savannah plains, wetlands, acacia forests and scrub. 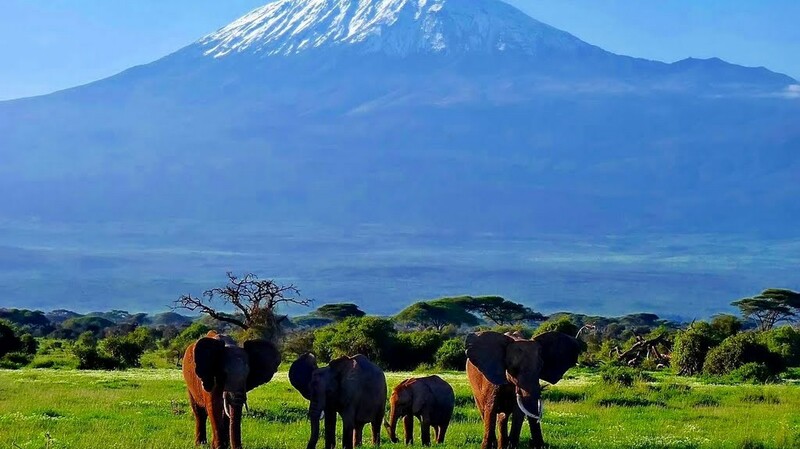 For over 40 years, it is a protected area that is famous for its serene beauty, wildlife animals, and big heards of elephants that easy to approach. The mashy landscape, with Mount Kilimanjaro in Tanzania on the horizon. Unlike other areas, the elephant population of Amboseli did not suffer from poachers. The result is an impressive 600 pieces depicting elephant population, who are frequent and prolonged studied. 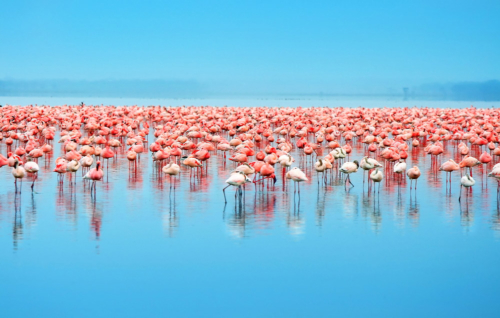 In addition to this impressive flock there also are buffalos, gazelles, wildebeests, giraffes, zebras, lions and cheetahs. Day 5: Ambuseli Park to Tsavo East Park- In the Tsavo East National park, you will see the Red Elephants and there are plenty, this reddish color is not how the elephants here were born but the soils of the Park in which they live is naturally of this color and the elephants regularly enjoy dust baths. 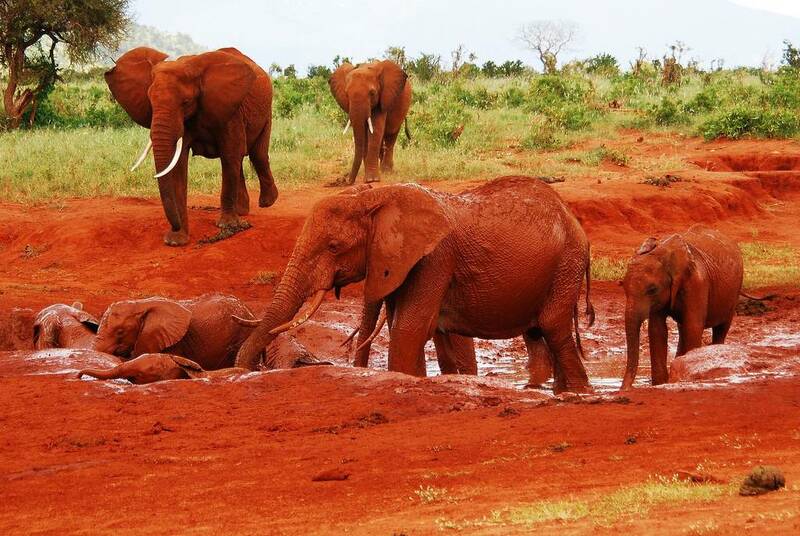 Tsavo East National Park is one of the largest game reserves found in Africa, you will find undeveloped wilderness with big numbers of animals.Tsavo East is also the home to the world's longest lava flow named the Yatta Plateau, it runs along the western boundary of the park above the Athi River. Its 290 km length was formed by lava from Ol Doinyo Sabuk Mountains. 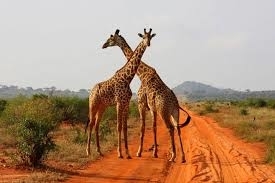 Tsavo is home to most of the larger mammals, vast herds of dust –red elephant, Rhino, buffalo, lion, leopard, pods of hippo, crocodile, waterbucks, lesser Kudu, gerenuk there are also lots of different kinds of birds found in Tsavo more than 500 recorded species. Day 6: Tsavo East Park to Diani Beach- We will enjoy one last morning safari and head to our beach paradise of Diani to settle in and relax. Day 7-13: Diani beach! 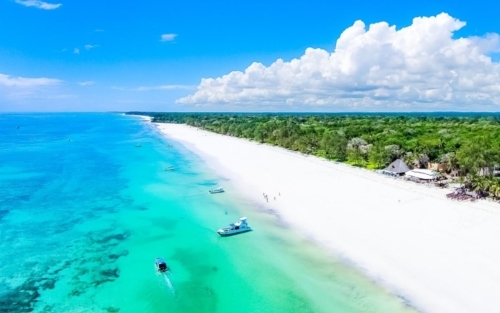 With a flawless, long stretch of white-sand beach hugged by lush forest and kissed by surfable waves, it's no wonder Diani Beach is so popular. During our beach decompression week we will practice daily yoga at our stunning accommodation just 300 meters to the beach, eat delicious food from our private chef and relax under the sun, either poolside or on the white sand beach. We will take a Dhow boat excursion to snorkel and hopefully swim amongst dolphins, visit a monkey sanctuary tour the locals towns by bike and more! There are loads of activities in the breathtaking beach town, or simply lazing in a hammock with a book. The classes will be for all levels and held typically 1-2 times per day depending on our travel schedule. During some of the safari days we will have a break day. The morning classes will focus on a Vinyasa mix, exploring many types of practices such as Ashtanga, Hatha, Bikram and Vinyasa. We will ease into the evening with restorative, yin, breath work and guided meditations. We will focus on on the depth of yoga, re-centering our minds and bodies by escaping the chaos of society with a goal to take the peace of yoga home with us in the mind, body and soul. See more about your instructor, Melissa Andersen, in the ABOUT section of this website. A non-refundable deposit of $1,000 USD or 8.000 KR is due upon booking. The remainder is due September 1, 2019.